BBC WebWise - How do I get broadband? A home broadband connection will allow you to access the internet - or 'go online' - in your home, at any time of the day. Many companies offer home broadband connections. These companies are called internet service providers, or ISPs, and provide broadband deals or 'packages'. You need to select the package that matches your needs and budget. Packages are priced based on factors like the speed of your broadband connection or the amount of data (digital information such as music and video files) you can download each month ('download' means to transfer a file from the internet to your computer). Print: How do I get broadband? Often broadband is bundled with your phone line rental, satellite or cable TV package, which can reduce costs. Communications regulator Ofcom has a list of approved comparison websites where you can research the best deal for you. Take a look at the Related Links section at the end of this guide for more details. Once you've picked a package, call the internet service provider so they can confirm that your phone line can be used to access broadband. You will then receive a small device - called a router - in the post. The router will connect your computer to the internet via your phone line. Follow the instructions supplied and plug the router into a power socket and use one of the cables provided to connect it to a telephone wall socket. When it's set up, the lights on the router should turn on. The next step is to connect your computer to the router. 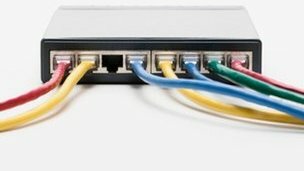 If your computer is close to the router, you can connect directly via an ethernet cable. You can also connect your computer (or other internet-enabled device) to your router wirelessly, using a system called 'Wi-Fi'. Wi-Fi is a way of transmitting computer data through the air using radio waves. This way of connecting is often easier as your computer doesn't have to be close to the router - it can be anywhere in your home. You'll need to enable the Wi-Fi settings on your computer and select your router's unique name. This is usually printed somewhere on the router itself. You may see other networks listed too. Don't worry, this is normal - they are probably your neighbours' Wi-Fi networks. Your computer will then ask for the router's password. This is usually printed somewhere on the router's case, often next to its name. This password is to stop other people using your Wi-Fi connection without your permission. Make sure you keep this password in use as your security is very important. Any internet-enabled device in your home - including other computers, smartphones, tablets and games consoles - can now go online via the same Wi-Fi connection. 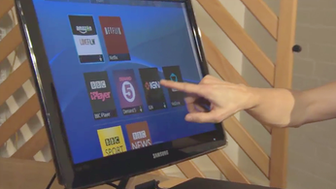 Today, many TVs are also internet-enabled 'smart TVs' and let you watch films or TV shows downloaded via your broadband connection. All these devices connect via the one router, and you'll need to enter the same password for each device. You can also get broadband via the mobile phone network. To connect in this way, you'll need a device called a 'dongle' which plugs directly into your computer. This could be an option if your phone line is not suitable for a broadband connection - for example, if you live a long way from the nearest telephone exchange. WebWise: What is broadband speed?